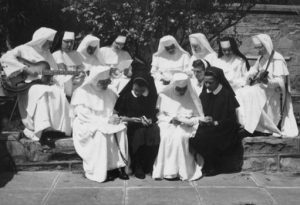 It had been Mother Augustine Geisel’s dream that vocations to the Religious life would be drawn from the local African peoples. 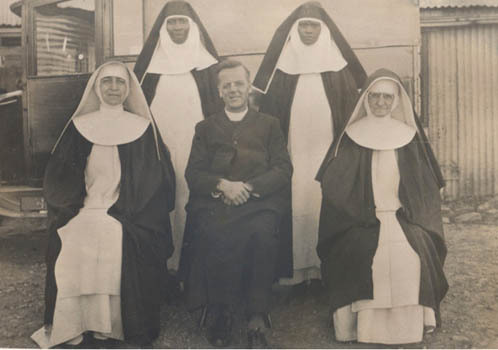 Her dream was realised when the first two African Sisters in 1927 Caroline Mabentsela (Sr Mary of the Holy Cross) from Keilands, Eastern Cape and, in 1930, Coletta Mfaladi (Sr. St Anne of the Cross) from the Zeerust area joined the Congregation and made their Profession 3 July 1934 at Maria Hilf Convent Noviciate. (See photo above.) Others were to follow. Many of the institutions, schools and missions which had been established around the country were closed in the 1950s due to government pressure to lessen the influence of the Church in African circles. Despite this, the work that had been done lived on in the minds and hearts of the people. Women who had been trained at the Teacher Training College in Village Main, City Deep, Johannesburg carried the education and spirit they had received into schools throughout the country. A number of them later joined the Congregation. In the 1940s and early 1950s, when the Congregations was it its height in vigour and in numbers, Apartheid became entrenched in all the structures of the country. The Bantu Education Act and the Separate Amenities Act were passed at about the time of the outbreak of the Second World War. The same spirit that was driving Hitler was also driving Hendrik Verwoerd and the architects of the Apartheid Regime. Hendrik Verwoerd and anyone suspected of Nazi tendencies at the time was imprisoned. The German Sisters of the Congregation were granted indemnity by Prime Minister Jan Smuts, resulting in a loyalty to the Governement which extended even beyond his rule. When the Separate Amenities Act came into force the Sisters applied this policy even to members of the Congregation. The African Sisters lived, prayed, ate and worked in different places and under very different conditions from those provided for “White” South Africans and Sisters from Europe. 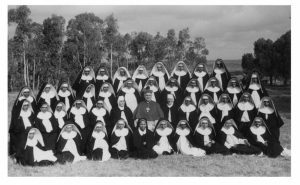 In the late 1950s, in this atmosphere of mistrust, the separate Diocesan Congregation of St Martin de Porres was formed in the Port Elizabeth Diocese for the African Sisters. In the 1960s and 1970s, under the ‘Group Areas Act’ there were three Noviciates within a 50 km radius of one another. One was for the “Black” Sisters, one for the “Coloured” Sisters and one for “White” Sisters. In the late 1960s and early 1970s the Sisters of the St Martin de Porres Congregation asked to be re-united to the ‘King’ Congregation. 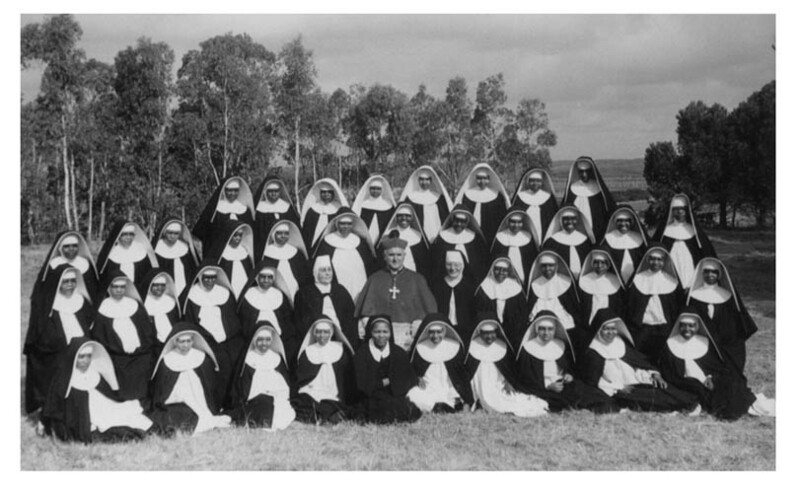 They first became a Province of the Congregation with Sr Regula Schelle as Provincial from 1971 – 1981 and then, in 1982, when the Black Consciousness movement and the liberation struggle was at its height, the Province was dissolved, again at the request of the Sisters, and once again there was one Congregation as had been desired by Mother Augustine and her Council in 1932. Some ‘Black’ Sisters in exclusively Black Diocesan Congregations considered the Sisters as traitors for wanting to be part of a ‘White’ Congregation. Hard questions had been asked and difficult decisions had been made. Paradoxically, while this re-unification was happening between ‘White’ and ‘Black’ Sisters, the ‘Coloured’ Sisters, who had never been separated, were asked to live in the Convent in Cradock in the false belief that this would give them a sense of identity and pride. The Coloured Sisters considered this move as an exile and a number of Sisters left. The experiment was not a success.